$listview_sysinfo.Items | Select-Object -ExpandProperty SubItems |Export-Csv -Path "C:\tmp\LookupBug.txt"
You have to extract the text of each subitem. PowerShell Studio has a built in debugger. I recommend starting by reading the product manual. You can access it on the help tab. with above code i get every item in a list. I want to get it so i can pair the property and value together? on the same line? How do i select columm `? That is just an example of what properties are on a ListViewItem. You need to use them to create a custom object and output that. Start with an empty hash and add the "Name" and "Text" to the hash then convert to an object. How to i get the items and subitems... all value are under Text? Where is the hash? Where is the custom object? You have to enumerate "Items" and "SubItems" and add the "Text" to the hash keyed by "Name". See above example of how to use a hash. I wiIl search and see if I can find an example. 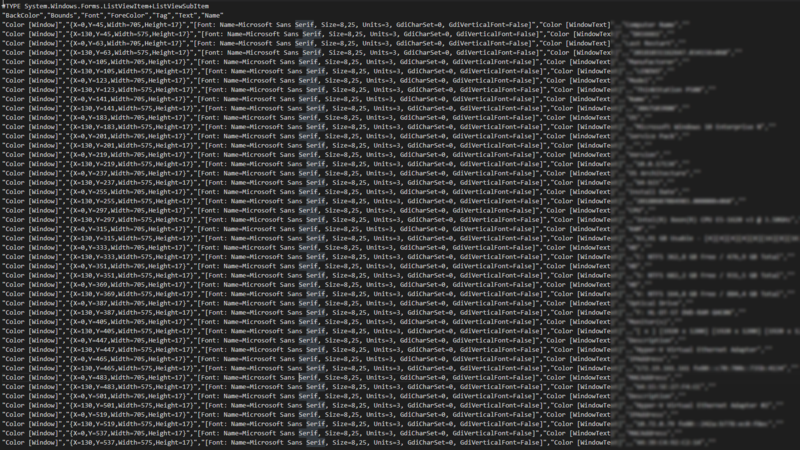 Well, as I suspected, no one seems to ever have decided to export the contents of a ListView. The issue is that ListView is not a data aware control and has no sense of data. It is just a bag of controls designed to allow different methods of viewing information. There are many third party ListView controls that support "data binding". Normally we would use one of those or crate a custom control to do this. In PowerShell it is important to learn how to enumerate complex object collections, Once you can master this fundamental skill most things in PowerShell become much easier. To that end I will give you a mii tutorial. First enumerate the "Items" collection and add the item to a new hash. This gets you all of the items with the name used to create the item as the property and the text of the item as the value and create a collection of objects that are output to a Csv file. This is the classic "design pattern" for enumerating and exporting a complex object. All of the world of OOP (Object Oriented Programming) is implemented around this concept. Windows, the Net Framework and PowerShell are all object systems. From the basic pattern we can now add a second level of generalization that we target at the "SubItems" collection to add it to our custom object. The total code required is on simple pipeline. The full generalized implementation for exporting a ListView is as follows. An easy way to work out these things is to export the PSF to a PS1 file and run with PowerShell. If you edit the exported ps1 and make the "$listview_sysinfo" variable a "global" it will persist after the form closes and you can then test manipulating this object interactively at a prompt. This method is a valuable tool for interactively inspecting and testing code against a complex object until you understand how you need to build the code in the form.